When firefighters have to enter a burning building, much of their job still involves blindly feeling their way through dense plumes of toxic fumes in search of those trapped inside. However, a novel new helmet design could one day give firefighters the ability to see through the smoke and hear beyond the roar of the flames. Dubbed the C-Thru, this helmet-visor-respirator concept offers a host of integrated functions that are currently only available as standalone devices—such as handheld thermal sensors and communication devices. So rather than having to crawl under the smoke while constantly checking a hand held thermal sensor and trying not the lose the rest of the team behind him in thick smoke, a lead firefighter with a C-Thru helmet could just look around, but with super vision. 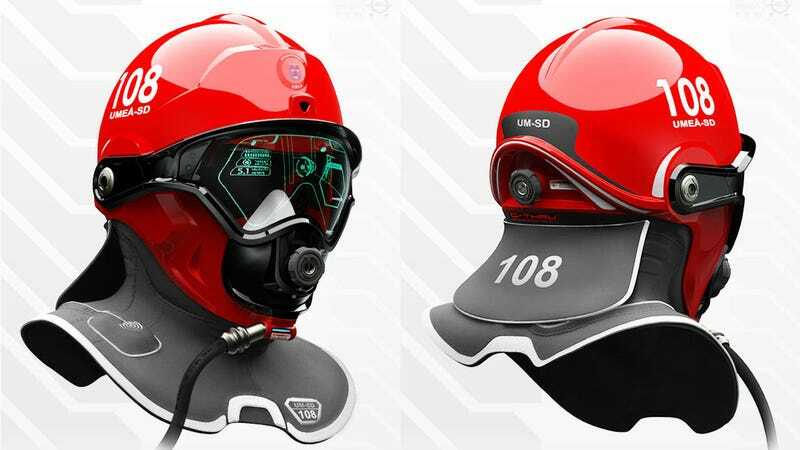 Basically, the helmet would wirelessly transmit environmental and video data to a cloud-based analysis service via the firefighter's mobile computing device. Then, the processed information would be distributed to every member of the team and displayed on their HUD visors as a wireframe overlay of their surroundings—similar to the current generation of HUDs employed by the USAF. This would free both of the firefighter's hands for more important tasks, like dragging people to safety. Plus, the recorded video data could be saved for future reference and training—potentially even as evidence in lawsuits against the fire department as the SFFD's helmet cam footage of that Asiana crash was. What's more, the C-thru will reportedly feature a noise-canceling function that could drown out the crackle of the burning building so firefighters could listen for cries for help as well as the telltale crunch of timbers before they collapse. That would also free firefighters from having to scream at each other through their walkie-talkies to be heard. And since the entire system is integrated into the helmet itself, it's just as easy to wear as the existing generation of firefighting helmets.